You don’t need to wait the usual hour after sunset to see this show. Bright Venus glows in the west all month. 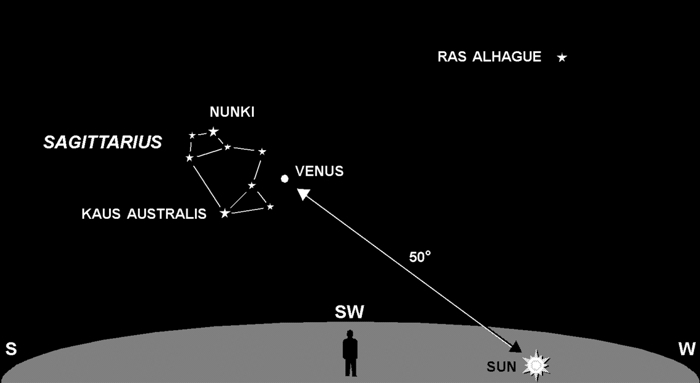 In fact, if you know where to look, you can see Venus in the daytime. Venus is one of the easiest objects to find because, next to the Sun and Moon, it’s now the brightest thing in the sky. Look in the general direction of southwest, just after sunset, and you’ll spot it for sure. Just to the south of Venus is the easily recognized constellation Sagittarius (aka “the Teapot). Its stars are dimming as it dives lower each night toward the western horizon. Venus, on the other hand, will continue to brighten, rising higher at sunset each night until late November, after which it will begin its dive for the western horizon. If you have a telescope or good binocs, Venus will show a “half phase” almost like the Moon, but without any craters. The thick clouds in its atmosphere is what makes it so bright. Alas, they also obscure our view of its surface.